Having read the revealing biography of JNT I have decided to revisit this era of Doctor Who, with the discussion focusing on some of the memorable and often widely debated moments. John Nathan-Turner had worked on a few Doctor Who serials, starting with the Space Pirates in 1969 as a floor assistant and subsequently later stories such as The Ambassadors of Death and Colony in Space. During the production of ‘The Talons of Weng Chiang’ he began as Production Unit Manager and held the position through Seasons 15, 16 and 17. In 1979 he then became the Producer of the show, taking over from Graham Williams and was tasked with taking Doctor Who in the 1980’s. Season 17 had been problematic for the production team. The Erato effect in ‘Creature from the Pit’ failed to cause anything but uncontrollable laughter amongst the crew, ‘Nightmare of Eden’ had indeed been a nightmare with the director leaving during through the production, and the final story of the season ‘Shada’ was completely abandoned due to industrial action. The tone of the product on screen had also become noticeably lighter than the horror-influenced period of Philip Hinchcliffe and Robert Holmes, largely attributable to Script Editor Douglas Adams. Behind the camera the star of the show Tom Baker had also become more opinionated and difficult to manage but also the budget for the show was struggling to cope with the demands required of the production. This was the environment which faced John Nathan-Turner, a daunting task for an individual who had not been a producer before. As a result Barry Letts was appointed Executive Producer to oversee JNT as he began to take the show in a new direction. The first story to enter production was David Fisher’s script ‘The Leisure Hive’. JNT would use this story to begin to ring the changes, updating the look and sound of the show, removing some of the comedy elements and scaling back the appearances of K9 and the sonic screwdriver. With the suggestion of Barry Letts and incoming script editor Christopher H Bidmead, there was a return to stories being influenced by real, or at least what could pass for real, science. In this story tachyonics is the predominant science mentioned, which was based upon tachyons that are theoretical particles which move faster than light. This method grounded the show back into a world of realism and plausibility and away from the fantastical tales of the previous regime. 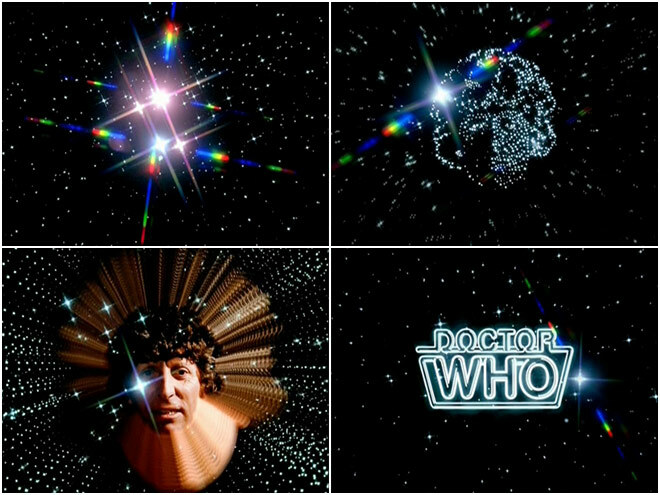 The first and most notable change was the new title sequence, incorporating a journey through space, a new image of Tom Baker and redesigned logo; it was also accompanied by a new arrangement of the theme tune by Peter Howell. The new titles would later become more associated with the Fifth Doctor but the travelling through the star field proved highly successful and continued throughout the 1980’s. It still retained the travelling motion which had been established by the previous ‘time tunnel’ sequence and it is still used today in the modern show. A reimagining of the logo to a very on-trend neon tube design has dated a little but at the time was fresh and further established a new era of the show. The new look immediately catches the eye but unfortunately that initial excitement is let down by an interminable panning shot of the Brighton seafront until the Tardis is finally revealed. 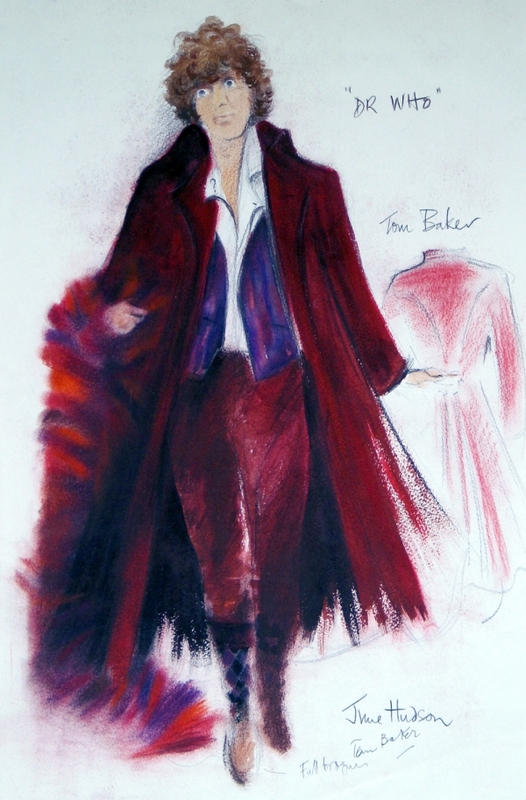 Tom Baker’s costume also got a facelift, superbly created by expert costume designer June Hudson; it had a fresh colour and new materials but still retained the iconic scarf associated with his Doctor. Under the direction of JNT question marks were added to the collar of Baker’s shirt but wisely Hudson made them subtle, unlike the plague of question marks across Sylvester McCoy’s jumper. The costume fitted the fourth Doctor at this later stage of his regeneration. It was more stylish; colour coordinated and had a maturity which elevated it above the previous casual ‘student-esque’ look which had been highly successful. Now however the Doctor had become older, which was reflected in the new title sequence image, and amusingly acknowledged with him asleep in a deck chair on Brighton sea front. The Doctor’s character becomes more melancholic and less dominant in the story, with the comedic elements almost entirely removed. Entering his seventh and final year in the role Tom Baker delivers a memorable performance, particularly after being aged but still retaining his presence and appeal. Tom Baker was and always will be associated with his role as the Doctor, he had become iconic in the role and to some children had indeed been the only Doctor in their experience. 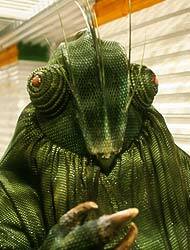 So although the Fourth Doctor had matured he was still that alien mysterious personality, just underneath a new costume. The new look for the show included more than just the lead actor’s appearance. 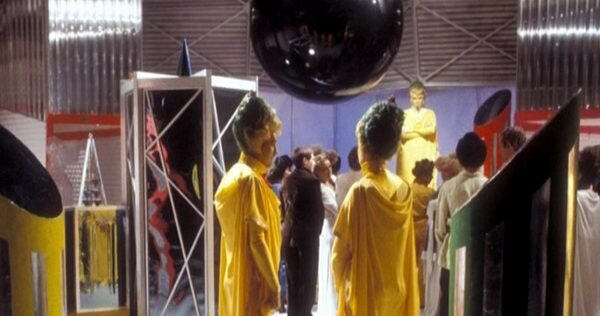 The Leisure Hive on Argolis delivers a bright and colourful environment with the Argolins in particular looking fantastically bold, which contrasts greatly to the dreary appearance of Earth. I personally like the addition of the nodules on the horn which indicates the Argolin’s age and how close they are to death. The Foamasi are also noticeably different in terms of the way they are featured very sparingly on screen, shadowy shapes, peculiar eyes peering round corners, all suggest a notable alien creature. Unfortunately, the final look is ultimately unimpressive, portly and covered in a peculiar fabric intended to appear as scales but essentially failing. One of the more successful effects utilised for the first time in the story was Quantel, a digital image processing system which allowed the creation of the cliffhanger for episode 1 which appear to show the Doctor being torn apart. These are simple effects which can be created easily nowadays but at the time added to the fresh appearance of the programme, pushing the technical boundaries further than had been previously achieved. Even the Tardis exterior prop received a redesign, notable for the stacked roof consistent with the original prop from the 1960’s. Further changes noticeable in this story include the move to include new electronic music. JNT took composer Dudley Simpson, who had contributed to an extraordinary number of stories over the years, out for lunch to inform him that his services were no longer required. From that point on all incidental music fell into the remit of the historic BBC Radiophonic Workshop. As a result the show looked but now also sounded more contemporary. Unfortunately, the production of the programme went over budget and it is thought that this is the reason for director Lovett Bickford never being appointed on any further productions. 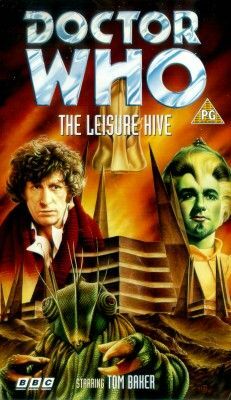 Despite this ‘The Leisure Hive’ achieves exactly what ‘The Eleventh Hour’ managed to in 2010. It was still Doctor Who but it felt new and fresh and different. Tom Baker delivered another commanding performance in the next story, playing both the Doctor and his evil doppelganger, Meglos. The story was also notable for the appearance of Jacqueline Hill, who had played original companion Barbara Wright, an early example of Turner’s penchant for ‘stunt casting’ to gain attention for the series from the press. It also saw the use of more new video technology, ‘scene sync’ which allowed for CSO (green screen) effects to support camera movement instead of static shots. The use of CSO may also have been a solution to avoid building sets and ensure this story came in under budget, unlike ‘The Leisure Hive’.